I love scrambled eggs but could never get them right. They either are too runny or have a rubbery texture. This morning I gave scrambled eggs another go and was half satisfied with the result. The eggs tasted good, but I think I overcooked them just a little too long - again! Next time I may add a bit more milk, or simply replace milk with cream. Oh well, that's the fun of cooking - try and try again until you get it right! 1. Whisk the first 5 ingredients in a bowl until all they are well combined. 2. Heat the butter in a non-sticking pan over medium heat. Once the butter is melted, pour in the egg mixture and let it sit. When the eggs begin to solidify, use a wooden spoon to scrap the eggs from the sides of the pan and fold them over into the middle. Repeat this until eggs are slightly runny and softly set. Remove from the heat and leave it for a bit to continue cooking. 3. 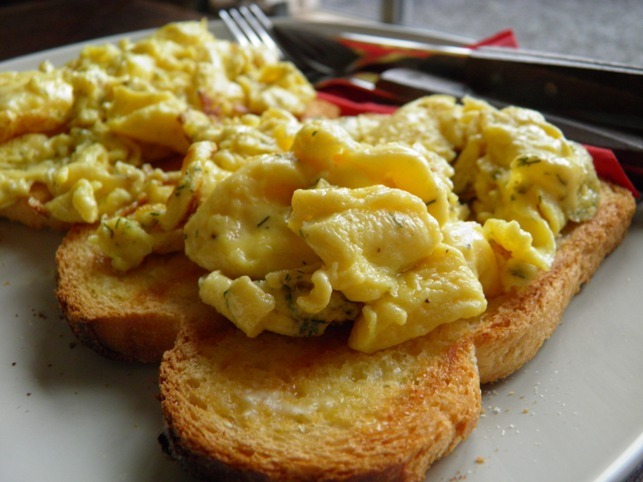 Once the runny bits have disappeared, transfer the eggs onto two sliced of buttered toasts.